International One Meter RC yachts are a very popular class in the UK, they make for great racing boats that experts and beginners can sail easily. Being a strick class, the design and weight of the boat has been standardised for years meaning boats are fairly evenly matched, making racing close. Keep up to date with the latest International One Meter news and future 'other' class racing dates for the 2019 season here. A handicap race trial coming soon. Check all the latest racing results, 2018 results, find out how the scoring system works or simply want to find out more information about how to take part. At Margam we use the popular triangle course which tests the skill of all sailors no matter the direction of the wind. Standard races are three laps in moderate wind conditions. 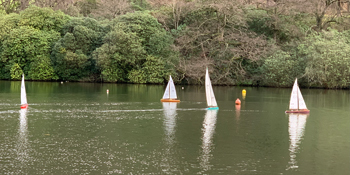 A small selection of International One Metre yachts practising at our regular home at Margam Park, south Wales.